"Saturday night, Hollywood and online collided and created a beautiful child in the 1st Annual Streamy Awards. Held at the historic Wadsworth Theatre in Los Angeles, the awards celebrated some of the top talents in the web series industry (which, I think we can now call it an ‘industry’).." Tabitha Smith tells us why it was such an important event. 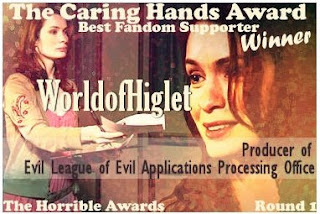 Thank you for voting - I won two Horrible Awards! In the fury of the last few days I sought solace on Twitter a moment ago and saw @Tabz had tweeted the link to the Horrible Awards. It had completely slipped my mind that the results were out today! Everyone in the fandom, because this was a great chance to catch up on work that we might otherwise have missed. And also - I won two Awards! "This is very difficult to judge in conventional vid terms because it's very nearly static apart from the moving hands, which almost become characters. There are no special effects or transitions but the script is absolutely hilarious, delivered in a Northern British accent which perfectly lends itself to the dry, snarky humour. Despite the lack of action, the script delivers on every level and ensures that the audience becomes involved in the narrative and, crucially, is not patronised but invited into the world of the ELE Applications Processing Office." The other winner in this category was 'Armaniac: tailor to the evil' by Niklas Ringdahl and the runner-up was 'Womanizer' by winterevanesce. There are many other categories, so please go and check out all the winners. And if you want to see all the videos and also download the scripts for the ELE Applications Processing Office you can do that on my new writer's blog. "This was a special category, in that every nominee is a winner. 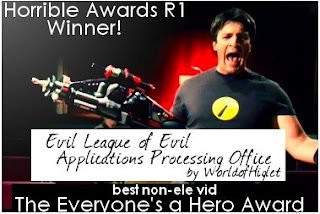 I decided that if someone thinks you've done something special to promote/support the growth of Dr. Horrible fandom, you deserve an award, so everyone wins!" Other winners in this category were Tabz, Dr Blog bot, Beth Nelson, Snowpuppies, The One True b!X, Jackwabbit, Donteatacowman. To everyone who voted - whoever you voted for, because this was a brilliant idea of Snowpuppies and I am humbled to have won an award for my writing (and possibly my fancy arm work ;)). Squeeeeeeee! EXTRAS NEEDED: So you wanna be in a movie? Have you ever wanted to hang out in an old western saloon? Would you like to walk down an old western street that has been decorated for the Chinese New Year? Would you like to possibly participate in a saloon-style brawl? Big Damn Fan Films, Inc. will be in need of several extras for their independent film, “BROWNCOATS: REDEMPTION”. The Streamy Awards 2009 - oh what a night! But at first I could only hear it. The Streamys Red Carpet started at 6:00 PM (Pacific) and I duly tuned in to the Streamys' website but there was no feed. A quick check on Twitter confirmed that I wasn't the only one in the dark. After some delays, though, the live streaming started in time for the Awards. And what a ceremony it was! No long after it had started I realised that I take screen grabs, which sent me into a frenzy. The picture - live streaming on my 15" Macbook screen - was brilliant. So I was there, trying to follow Twitter, The Guild chat, the Streamys, making comments and taking screen grabs. Next year I will deploy more screens! And the first hosts are - Sandeep and Felicia! It opened with two very familiar faces. Felicia Day and Sandeep Parikh were the first presenters and set the tone for the whole night - funny, snappy, professional and awesome. Sandeep hammed it up magnificently and it was great to see the obvious chemistry between these two friends. As I said, I was approaching systems overload with the monitoring so many things at once while coping with the emotions of seeing people I have been following not just receiving the recognition they deserve, but showing why it is deserved. If you were following my Twitter stream last night I apologise for the disjointed nature of the posts! Neil Patrick Harris' speech where he dissed Nathan Fillion and asserts that he "...pads his junk..."
Cameos from Felicia and Kim Evey (as Kiko) in the 'How to make a web video' short - hilarious! Lisa Kudrow - I'm not sure what was going on but it amused me! Post from Storygas - interesting mix of tweets! I've put up the screen grabs up on my Flickr account - there's 46 of them. There are probably more, so I'll check later and upload them. And tag the ones that are there. The future is here. And it's web television! The Streamy Award ceremony was awesome. I need at least a day to recover, and I wasn't even there! ELE Application Processing - want to see some scripts? It's a difficult one to judge. I love to read scripts, to see how things have been produced and where the ideas came from. I'm not sure if other people share this interest, though. Just in case you do, I've uploaded the scripts for Season 1 of the ELE Application Processing Office onto my new blog and you can download them from there. Well yes. You might be aware that I've written a novel (!) and I'm now trying to find an agent so I can market it. In order to do that I need to decloak and be a real person. Well, for some of the time, anyway. It's not been an easy road, from closet nerd to full-on geek, and I'm not sure I'm fully out yet. Some days it's scary. Will people understand? Will I be accepted? Will the soccer-mums shun me (more)? I'm who I always was. WorldofHiglet is not going away. And neither is this blog. All is well, no need to fret. I'll be blogging here and on the other blog and other places, too (hello Pink Raygun!). And as soon as I have any news on the book I'll let you know asap. Isn't life exciting? Do you want to talk to Zaboo? Well it's your lucky today because Sandeep Parikh (creator of the Streamy-nominated Legend of Neil, who also plays Zaboo in The Guild) and Tony Janning (who plays Neil in the Legend of Neil) are both guests in the new online radio show "Fangirl's Guide to..." TONIGHT! Cricket Lee and Jared Hoy, two wonderful Guildies. The new show is going to cover all manner of fandom but they kick off tonight with a great opportunity to ask those searching questions you've always wanted to ask. 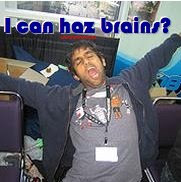 Like how much of a zombie is Zaboo, did Neil ever play Zelda, and if he did how much did he enjoy the 'graphics', and how weird is it to direct Felicia Day? This show is LIVE on LATalkRadio.com. You can be part of it by sending in questions via Twitter to @FanGirlsGuide and using Skype 'LATalkRadio' or calling (323) 203 - 0815. I'll see you there! "6 companies control all the media that you are seeing..."
This is a tour de force from the Wingmen - people who are making a difference by supporting the truly independent sci-fi/fantasy film ARTEMIS ETERNAL. You need to watch this video if you care about taking back control of what we are allowed to see. Jessica Stover is inspirational as always - and so are the titular Wingmen. Very stirring stuff - you won't be disappointed. Contagious: Scott Sigler does it again! Do you like Sci-fi? How about horror? If you like either then you will almost certainly love 'Contagious'. And if you like both then you will want to add Contagious to your collection. I first heard of Scott Sigler last year via Buffy: Between the Lines and Tabz. B:BtL had information on their website about this author who was giving away free downloads of their book before the print release and, on a whim, I downloaded the PDF of 'Infected'. After I had read a couple of chapters I ordered the book - I wanted to see it in print and have the pleasure of dreading to turn the next page! Contagious carries on where Infected ends, and we find out more about the deadly triangles and where they have come from, and what they are capable of. One of the effective and joyous aspects of Scott's writing is the way he uses scientific principles to underscore the story. For me there was a real thrill in reading and imagining the terrible twists in function that the infection undergoes. The vivid descriptions put you right in the action and no splatter or gout is wasted. As with 'Infected', the pace is breath-taking and I read 'Contagious' in little over a day. You'll want to know how it all turns out! And it was a great reward for finishing the first draft of my novel - thank you Scott! Maybe I haven't convinced you that you should buy Contagious. Fair enough. How about if you sampled it for yourself? Because not only is Mr Sigler a formidable writer he is also a highly successful podcaster, and you can listen to the first chapters for free, read by the Future Dark Overlord (tm) himself. You can download that and more of his work from his website. 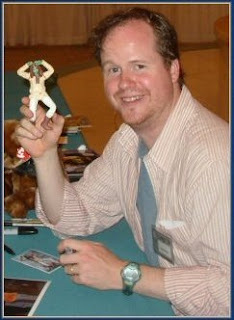 Scott is also on Twitter and writes a regular column for AMC, delving into the underbelly of horror in all it's gory. Firstly: did you meet Cricket yet? Cricket Lee was kind enough to let me interview her about her experiences as an extra on The Guild set. I have posted the edited version of this on Whedonage along with some background biography. (It was especially kind of her because this was the second time. I had mucho trouble with the first one because iMovie would not import it correctly - so thank you Cricket!). I first met Cricket on the WatchTheGuild.com community site after the Dr Horrible screening last year and she shared her experiences about that on another blog post. But it was brilliant actually talking to her via Skype. Because YouTube only allows videos of 100 megs/less than 10 mins I had to edit it down quite a bit. But if you'd like to hear some more then Cricket has uploaded another part of it where she talks about Joss at the Dr Horrible screening - it's a funny story! ...and my blog post about my choices was a 'very Honorable Runner-up'. Cool! Unfortunately I didn't win the tickets for the Awards Ceremony (that honour goes to Ben Shult from St. Timmy Productions) but it's good to know that my hit rate of 4/10 (The Guild, Dr Horrible, After Judgement and Legend of Neil) and wasn't too bad. And now - have you voted today yet? You can vote once every day up until the 28th March for your favourite so if you love more than one special webseries you can alternate your votes. Just remember to vote every day! Even though I won't be there at the Awards, I'll be watching the Live Feed. To me, this is much more exciting than the Oscars! I've followed many of these people for a while now and to see them honoured in the Streamys Awards is a huge thrill. 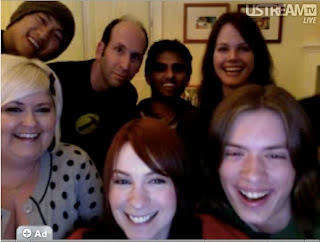 Felicia Day: new media guru? After appearing at the SXSW 2009 and then in Improv again last night, where else might you find Felicia this year? She blogged recently about her appearances in 2009 and the fact they are going to be limited this year due to the heavy commitments she has. But she and The Guild will be at San Diego Comic Con in July and Felicia will also be at the Starfury Con in England in April. And what is she doing in the meantime? Writing Season 3 of The Guild, working on other projects such as an upcoming Machinima production and making guest speaker appearances such as the one she will be making at the 'Future of Television West'. It is heartening to see that Felicia is being asked to speak at such events because it shows that web shows, and the people who create them, are being taken seriously. "Felicia Day, our beloved Penny from Dr. Horrible and Writer/Creator/Actress from the Guild is set to speak at the Future of Television West, which will be held at the Hollywood Roosevelt Hotel in Los Angeles, CA on Tuesday, March 24 and Wednesday, March 25, 2009. This year’s theme is “Transforming Television for a Connected World”......"
Tabz has all the details on the 'Joss'd' website so why not pop over? And then maybe you'd like to spare a Digg....? "After months of campaigning and hundreds of tweets, the Streamys nominees were finally announced. Predictably, heavy hitters like Dr. Horrible, The Guild, and Legend of Neil swept the nominations. Kudos to them. They’ve had great years, great shows and they deserve the recognition (isn’t that the point?)...." But there has a bitter backlash...Why? This is an interesting article for anyone who love webseries and has been awaiting The Streamys. For what it's worth, my opinion is that the people who have been nominated, and the members of the new International Academy of Web Television (IAWTV) are all at the forefront of web television. They have worked hard to get the recognition they have gained and deserve to see success because of their hard work. Streamy Awards: My list for the People's Choice! "Audience Choice Voting starts on Monday! For those of you who absolutely can’t possibly wait to start voting, blog your best guess of the Audience Choice Award lineup (pick 10 web series!) — the blogger who’s lineup is closest to the official lineup announced at the end of the day on March 16 wins two (2) tickets to the Streamy Awards Ceremony on March 28! Tweet links to your posts to @tubefilter on Twitter "
Some of you might be aware that I love this webseries for a multitude of reasons. See all the various posts here and there about why. They should be first. This is the best game show I've seen on the Web. If it is a game show. And if it isn't then it's still one of the funniest, freshest shows in webland. I heart Kiko! Actually completely Suitable For Work, you'd be hard pressed to find two hotter or funnier girls in shower on the web. The interaction and dialogue is awesome. It's a bit naughty and a lot funny. NSFW but you'll check it out anyway because it's got legs (Season 2 is shooting now). Isn't it great when you can share funny shows with your kids? Possibly not if it's Happy Tree Friends! Very funny with a gory twist every episode guaranteed to delight kids and horrify sensitive adults. These were very well done and they didn't spare the effects or writing. They (almost!) help to fill the time between Part 1 and 2 of the final season - but I'd have liked to see them released earlier. What's not to love about this series? From the people who brought you such stories as "Sony release another piece of..." and "Apple introduces new Laptop with no Keyboard", The Onion continues to take unaware bloggers and commentators by surprise. Perhaps too funny. I love the story and the acting is spot-on. I hope they do well because this is a very good series that builds really well. I'm new to this series but I'm really enjoying so far. The idea behind it is intriguing and the quality of acting and cinematography is very high. Halo, Machinima, taking the action and dialogue to the illogical extremes. This was a ground-breaking series that has stood the test of time for me. Okaaaay. Did I mention the migraine? It's made it hard to count. And to write much. Or get pictures....So - what are your picks for the People's Choice? If you have a list and blog it don't forget to send them to @tubefilter on Twitter. Streamy Awards: Official Nominees Announced! "Today we announce the official nominees for the 1st Annual Streamy Awards. Where else can you get a heated race between Lisa Kudrow and Felicia Day, or Rosario Dawson and Jessica Rose, or how about Tay Zonday and Eva Longoria Parker? Get ready for March 26th because that's when you can vote on your favorite from the 10 top submitted webseries..."
Get ready to vote on Monday......! Numfar: Do the Dance of Joy! It's done! First Draft is Complete! Okay, I have my draft and it's going away for a little bit. Then I will do the first sweep of edits and get it out to some beta readers. Beta readers, you say? Yes. I have some people lined up who are willing to sacrifice some time to read the 140,000+ words in this mighty tome. And then...well, we'll have to see. I want this puppy published but how that might be achieved remains to be finalised. Er, what's it about, anyway? Good question. It's a humorous novel about...well, think Tom Sharpe meets Ben Elton during a mid-life crisis and spawns a mutant love-child with him and Grant Naylor. But now with added Internets. Yeah, that about sums it up. It's a humourous novel about a 37 yr old geeky guy, separated from his wife, who loses his job and decides to go to University to get an IT degree. He is a decent guy, hooked on nerd culture but completely set in his ways, bogged down by daily life and acceptance of less-than-best. His gaming addiction doesn't help, either. And when his separated wife becomes pregnant, his life takes on a new turn. Sleep. And maybe a glass of wine. And much rejoicing. It feels good. Over the last few months many people on Twitter, The Guild chat, Facebook, Friendfeed and all over the internet have encouraged, cajoled and helped me. A huge thank you to all of you. I can't tell you how much it really helped. You rock! "There comes a point when one can no longer sit on an important fact...Wil Wheaton owes me $12.00.It was the late eighties, I was still in my single digits. I had seen a movie called Stand By Me, and while every other little girl my age fawned over River Phoenix, I fell in love with the boy who played Gordie LaChance..."
As part of the international year of astronomy, Galileoscopes (small telescopes) are available for only $15.00. There's a charitable giving option, as well. Want a limited signed picture of The Guild Cast? I know, who wouldn't?! With The Guild Season 2 now over we can still all tune into the Official Guild Podcast - Knights of The Guild (http://knightsoftheguild.podbean.com/). And to help raise funds to keep this fun podcast going the cast have signed some pictures. If you donate quickly you get a chance to have one of these pictures. Hurry! Open voice-casting call for Angel Between the Lines! The people who have done the wonderful and brilliant 'Buffy Between the Lines' are now holding open auditions for people who want to join their new venture: 'Angel Between the Lines'. There is a full listing of cast needed, how to apply, what is involved...if you have any interest then apply now! A brief description of six sites that will help you publish your work. No, I haven't finished writing yet (122,000 words and counting...!) but here's something I found via FriendFeed. It's a very interesting look at options available if you want to self-publish. Watch this space....!